Many League of Legends outright despise Teemo. However, even the biggest haters are going to want to play him thanks to his new Omega Squad skin. Riot Games really thought of everything in making this skin. Teemo is airlifted out by a chopper when he casts Recall. When he's idle, he sets up his rifle as a pull-up bar and starts doing one-armed pull-ups. He's got a full set of new Rambo-like soundbytes too such as, "Good men die. I choose to live." The downside to Omega Squad Teemo, though, is that it's expensive. The skin costs 1820 Riot Points, which is close to $15 USD. That's not to mention the cost of unlocking Teemo himself if you haven't already bought him. There are only three skins - DJ Sona, Pulsefire Ezreal and Spirit Guard Udyr - currently being sold for a higher price. 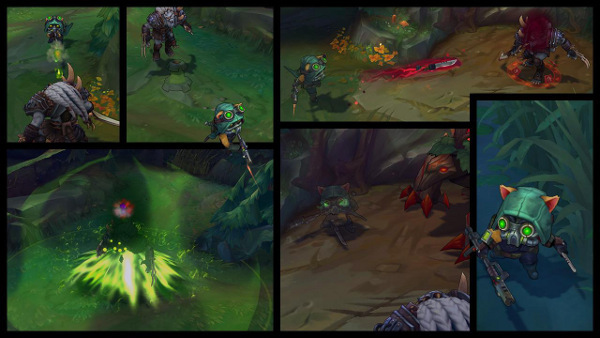 The high cost of Omega Squad Teemo will probably be enough to sour most players on buying it. I can't blame them; I've got a "no cosmetic items" policy for any game with microtransactions. Still, if I were the sort of person willing to spend money on looking good in a video game, this skin would be a sure purchase. It's much more transformative than the character recolors that Riot plans to sell. League of Legends's top players are currently slugging it out in the fifth season of the League Championship Series. Earlier this week, Riot announced the dates and locations for the world championship games coming this fall.